This is a late post because I got this during holidays and I am busy at that time and I was not able to share what I got on Sample Room here in my blog. I managed to post it via Instagram though when I got the items. It was a good thing that I had been able to get this before my VIP points expired. I got all the items in full size which is really great so I can maximize my testing. 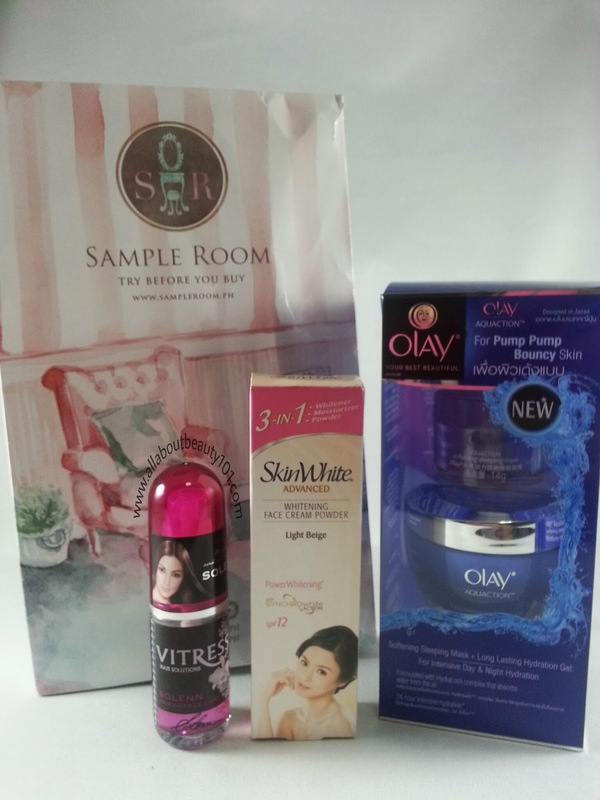 I am most excited to try the new Olay Aquaction Softening Sleeping Mask and Long Lasting Hydration Gel. It's a new product from Olay that is worth 859php. The Vitress on the other hand is a limited edition Solenn Hair Cuticle Coat that is worth 80php. Last but not the least is the SkinWhite Advance Whitening Face Cream Powder in Light Beige, Sample Room gave a 20g sample which is the biggest size in the market. It costs around 69php. I will post a detailed and separate product review for each item. Hopefully, I can post it soon as I have other pending product reviews that needs to be prioritized. Please understand that I am trying out each product that I got before sharing my insights. Thank you and have a great day everyone! If you want to try before you buy, just sign up here at Sample Room.